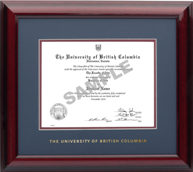 Introducing a new UBC frame! 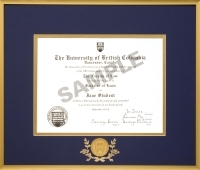 Solid hardwood frame with glossy black finish and gold accents. Includes black velvet mat board and gold leaf fillet. 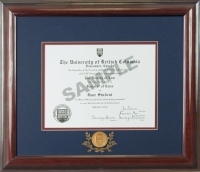 The UBC coat of arms is depicted in a 24k gold plated medallion at the top of the frame. 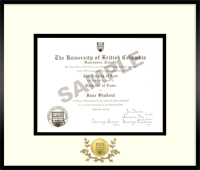 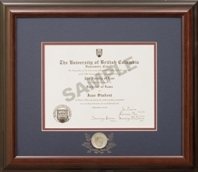 "The University of British Columbia" is embossed in gold foil at the bottom of the frame. AT THE OKANAGAN AND VANCOUVER BOOKSTORES. 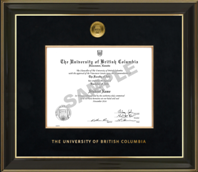 PURCHASE AT THE BOOKSTORES AND SAVE ON SHIPPING!